You know, the one who is super fit and always happy and you have no idea how they do it? You look at them and wonder, what am I doing wrong? Or, What can I do to be more like that? 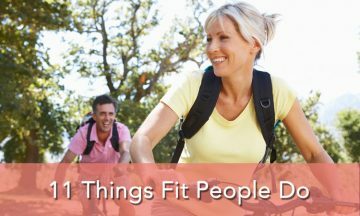 Well, it really is no secret that fit people do things a little differently than the average person, but why does it seem like a secret? It might be because it takes a motivated person to get fit and stay fit. It’s a lifestyle, not a cut and dry list of what you need to do to get fit. BUT, here are a few things that they do that may help you figure out how you can change your lifestyle to be a more fit lifestyle. 1. They Drink Water and Lots of It! Water makes up about 70 percent of our bodies, so making sure you are keeping yourself hydrated will help keep your body working at its optimum pace. While there are a number of benefits, a few particular ones that help lose weight include: Removing by-products of fat, reduces hunger, reduces food intake (if you drink it before meals you will feel fuller faster and eat less), raises your metabolism, and flushes out toxins. Since your brain is mostly water, maintaining hydration will also help to give you more energy and focus. People who are fit, usually just like to move throughout the day. Sitting on the couch all day is not going to help you stay fit. Stretching and doing a few small exercises when you wake up in the morning, parking in the back of a parking lot to walk a little further, taking the stairs whenever possible, and taking a walk break around your office when you’ve been sitting at your desk are just a few ways you can get moving a little more throughout your day. It doesn’t matter how little those extra moves are, the more you move the more calories you will burn. This should be a no-brainer, but fit people ENJOY exercise. They find what they like and stick with it. If you are having an issue with your exercise routine, try something else! Yoga, running, HIIT, Cross-Fit, whatever it may be find something you enjoy and you will look forward to working out more. Smaller portions = less food = less calories. Pretty simple equation, but overeating can be a major issue for some since portions have become out of control in the U.S. in recent years. A few ideas to eat smaller portions? Use small plates and bowls and small utensils. Make those red plates and those will help you eat even less. When eating out, immediately portion half of your meal to go, which will help you to not overeat if you feel the urge to clean your plate. Eating too quickly can add to overeating since you won’t feel full until you have already eaten more than enough food to be full. If you eat slowly, you will start to feel full when you have consumed the proper amount of food and your body will be able to tell you to stop. Cooking your meals from scratch allows you to control what all goes into them. Meaning you choose the fresh, seasonal, organic, grass fed, or other preferred ingredients. You measure the salt, sugar, or fats used in the recipes. Healthy people enjoy making their own meals in order to avoid the preservatives that come in processed meals and to enjoy the true flavors in the foods rather than the chemically created flavors and textures of processed meals. This goes along with cooking from scratch, but applies to meals you may not eat at home or days you are busy as well. Eating processed foods can be a killer. You know that “healthy” frozen meal you picked out for the night you know you’re going to be working late? Did you look at the nutrition facts? Those might surprise you, particularly, the sodium content. Did you know that the average frozen meal has more sodium than the average recommended daily allowance of sodium? If you like the convenience of frozen meals, check out some sectioned freezer-friendly plastic containers and put some left over’s in them for those nights you may be in a time crunch for dinner. Find yourself grabbing an extra granola bar a few times a week at work? Or maybe you eat a little too much trail mix a few days a week. Snacking mindlessly can be one of the most dangerous things you can do for your waistline. Snacking is NOT a bad thing, but when you don’t plan ahead for your snacks or don’t portion them out properly (like eating trail mix straight from the bag), its harder to keep track of how much you are eating and in turn, you will have probably added an extra 200-500 calories over the course of a day just in snacks. The biggest part in making healthy food choices is to prepare ahead of time. Now you don’t have to list out every single thing you are going to eat all week, but it won’t hurt to do that. If you, at least, plan out your dinners for the week, that is a great start. If you plan to make extra so you have leftovers for lunch the next day, that works as well. Just be sure to make a list before going to the grocery store each week and grab some extra fruits and vegetables for healthy snack choices while you are there. Have you noticed that the people who constantly obsess about their weight and are constantly trying the newest fad diet never actually manage to lose that much weight? That’s because losing weight isn’t a quick fix, it’s a lifestyle change. Sure you can start with a “diet” but chances are, if you are like 95% of other Americans your diet will fail and you will be back to your old habits and gain back the weight you lost. If you focus more on choosing healthy foods and less about losing weight, you will feel better and you will see the results. 11. They Understand It’s Not About Being Perfect! Sure, there are some people who never eat a bite of dessert because they want to stay lean. But to the rest of us, enjoying a treat from time to time can be a good thing. Its about finding your balance. Don’t feel bad if you want to go have an ice cream cone or a brownie occasionally, just remember not to do it every night, and you will be fine. Do you have another great tip? Share with us in comment below!